THE LIFE AND SPIRITUAL MILIEU OF MEVLANA JALALUDDIN RUMI,The Life and Spiritual Milieu of Mevlâna Jalâluddîn Rumi,Mevlâna Jalâluddîn Rumi In the last decades of the Twentieth Century the spiritual influence of Mevlâna Jalâluddîn Rumi is being strongly felt by people of diverse beliefs throughout the Western world. He is being recognized here in the West, as he has been for seven centuries in the Middle East and Western Asia, as one of the greatest literary and spiritual figures of all time. Different qualities of Rumi have been brought forth by a variety of new translations that have appeared during the nineteen-eighties. He has been presented as both refined and sensual, sober and ecstatic, deeply serious and extremely funny, rarefied and accessible. It is a sign of his profound universality that he has been so many things to so many people.,Rumi's Life,Jalâluddîn Rumi was born in 1207 in Balkh in what is today Afghanistan. At an early age his family left Balkh because of the danger of the invading Mongols and settled in Konya, Turkey, which was then the capital of the Seljuk Empire.His father Bahauddin was a great religious teacher who received a position at the university in Konya. Mevlâna's early spiritual education was under the tutelage of his father Bahauddin and later under his father's close friend Sayyid Burhaneddin of Balkh. The circumstances surrounding Sayyid's undertaking of the education of his friend's son are interesting: Sayyid had been in Balkh, Afghanistan when he felt the death of his friend Bahauddin and realized that he must go to Konya to take over Jalâluddîn's spiritual education. He came to Konya when Mevlâna was about twenty-four years old, and for nine years instructed him in "the science of the prophets and states," beginning with a strict forty day retreat and continuing with various disciplines of meditation and fasting. During this time Jalâluddîn also spent more than four years in Aleppo and Damascus studying with some of the greatest religious minds of the time.,As the years passed, Mevlâna grew both in knowledge and consciousness of God. Eventually Sayyid Burhaneddin felt that he had fulfilled his responsibility toward Jalâluddîn, and he wanted to live out the rest of his years in seclusion. He told Mevlâna, "You are now ready, my son. You have no equal in any of the,branches of learning. You have become a lion of knowledge. I am such a lion myself and we are not both needed here and that is why I want to go. Furthermore, a great friend will come to you, and you will be each other's mirror. He will lead you to the innermost parts of the spiritual world, just as you will lead him. Each of you will complete the other, and you will be the greatest friends in the entire world." And so Sayyid intimated the coming of Shams of Tabriz, the central event of Rumi's life.,At the age of thirty-seven Mevlâna met the spiritual vagabond Shams. Much has already been written about their relationship. Prior to this encounter Rumi had been an eminent professor of religion and a highly attained mystic; after this he became an inspired poet and a great lover of humanity. Rumi's meeting with Shams can be compared to Abraham's meeting with Melchizedek. I owe to Murat Yagan this explanation: "A Melchizedek and a Shams are messengers from the Source. They do nothing themselves but carry enlightenment to someone who can receive, someone who is either too full or too empty. Mevlâna was one who was too full. After receiving it, he could apply this message for the benefit of humanity." Shams was burning and Rumi caught fire. Shams' companionship with Rumi was brief. Despite the fact that each was a perfect mirror for the other Shams disappeared, not once but twice. The first time, Rumi's son Sultan Veled searched for and discovered him in Damascus. 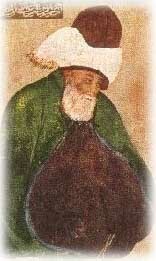 The second disappearance, however, proved to be final, and it is believed that he may have been murdered by people who resented his influence over Mevlâna.,Rumi was a man of knowledge and sanctity before meeting Shams, but only after the alchemy of this relationship was he able to fulfill Sayyid Burhaneddin's prediction that he would "drown men's souls in a fresh life and in the immeasurable abundance of God... and bring to life the dead of this false world with... meaning and love." ,For more than ten years after meeting Shams, Mevlâna had been spontaneously composing odes, or ghazals, and these had been collected in a large volume called the Divan-i Kabir. Meanwhile Mevlâna had developed a deep spiritual friendship with Husameddin Chelebi. The two of them were wandering through the Meram vineyards outside of Konya one day when Husameddin described an idea he had to Mevlâna: "If you were to write a book like the Ilahiname of Sanai or the Mantik'ut-Tayr'i of Fariduddin Attar it would become the companion of many troubadours. 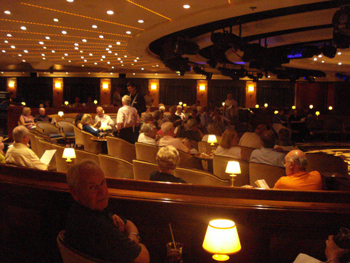 They would fill their hearts form you work and compose music to accompany it. ",Mevlâna smiled and took from inside the folds of his turban a piece of paper on which were written the opening eighteen lines of his Mathnawi, beginning with: ,Listen to the reed and the tale it tells,,how it sings of separation... Husameddin wept for joy and implored Mevlâna to write volumes more. Mevlâna replied, "Chelebi, if you consent to write for me, I will recite." And so it happened that Mevlâna in his early fifties began the dictation of this monumental work. As Husameddin described the process: "He never took a pen in his hand while composing the Mathnawi. Wherever he happened to be, whether in the school, at the Ilgin hot springs, in the Konya baths, or in the Meram vineyards, I would write down what he recited. Often I could barely keep up with his pace, sometimes, night and day for several days. At other times he would not compose for months, and once for two years there was nothing. At the completion of each book I would read it back to him, so that he could correct what had been written." The Mathnawi can justifiably be considered the greatest spiritual masterpiece ever written by a human being. It's content includes the full spectrum of life on earth, every kind of human activity: religious, cultural, political, sexual, domestic; every kind of human character form the vulgar to the refined; as well as copious,and specific details of the natural world, history and geography. It is also a book that presents the vertical dimension of life -- from this mundane world of desire, work, and things, to the most sublime levels of metaphysics and cosmic awareness. It is its completeness that enchants us.His Spiritual Milieu ,What do we need to know to receive the knowledge that Rumi offers us? First of all, it needs to be understood that Rumi's tradition is not an "Eastern" tradition. It is neither of the East nor of the West, but something in between. Rumi's mother-tongue was Persian, an Indo-European language strongly influenced by Semitic (Arabic) vocabulary, something like French with a smattering of Hebrew. Furthermore, the Islamic tradition, which shaped him, acknowledges that only one religion has been given to mankind through countless prophets, or messengers, who have come to every people on earth bearing this knowledge of Spirit. God is the subtle source of all life, Whose essence cannot be described or compared to anything, but Who can be known through the spiritual qualities that are manifest in the world and in the human heart. It is a deeply mystical tradition, on the one hand, with a strong and clear emphasis on human dignity and social justice, on the other. ,Islam is understood as a continuation of the Judeo-Christian or Abrahamic tradition, honoring the Hebrew prophets, as well as Jesus and Mary. Muslims, however, are very sensitive to the issue of attributing divinity to a human being, which they see as the primary error of Christianity. although Jesus is called the in the Qur'an "the Spirit of God," it would be thought a blasphemy to identify any human being exclusively as God. Muhammad is viewed as the last of those human prophets who brought the message of God's love.,In Rumi's world, the Islamic way of life had established a high level of spiritual awareness among the general population. The average person would be someone who performed regular ablutions and prayed five times a day, fasted from food and drink during the daylight hours for at least one month a year, and closely followed a code which emphasized the continual remembrance of God, intention, integrity, generosity, and respect for all life. Although the Mathnawi can appeal to us on many levels, it assumes a rather high level of spiritual awareness as a starting point and extends to the very highest levels of spiritual understanding. The unenlightened human state is one of "faithlessness" in which an individual lives in slavery to the false self and the desires of the materials world. The spiritual practices which Rumi would have known were aimed at transforming the compulsiveness of the false self and attaining Islam or "Submission" to a higher order of reality. Without this submission the real self is enslaved to the ego and lives in a state of internal conflict due to the contradictory impulses of the ego. The enslaved ego is cut off from the heart, the chief organ for perceiving reality, and cannot receive the spiritual guidance and nourishment which the heart provides. Overcoming this enslavement and false separation leads to the realization and development of our true humanity. spiritual maturity is the realization that the self is a reflection of the Divine. God is the Beloved or Friend, the transpersonal identity. Love of God leads to the lover forgetting himself in the love of the Beloved. WHIRLING DERVISH CEREMONIES IN ISTANBUL TURKEY,Whirling Dervish CEREMONY in Sirkeci Train Station ( Each Thusday and Saturday ) Whirling Dervish CEREMONY in Sirkeci Train Station,Every Tuesday and Saturday ,Start : 19 : 30 pm,Finish : 20 : 30 Pm Price : 40 Turkish Liras,Contact Person : Mr. Hakan HACIBEKIROGLU,more details.Whirling Dervish CEREMONY in Sirkeci Hodjapasha Culture Center ( Everday Except Tuesday and Thursday ),HODJAPASHA HOCAPASA CULTURE CENTER,Everday at 19 : 30 pm ( Monday ,Tuesday, Wednesday,Thursday,Friday,Saturday and Sunday ) Finish : 20 : 30 Pm,Price : 40 Turkish Liras including FREE beverages,Contact Person : Mr. Hakan HACIBEKIROGLU,More details.Whirling Dervish CEREMONY in Silivrikapi ( Each Thursday -- Men and Women together in Worship ) Known to the west as Whirling Dervishes, the Mevlevi Order was founded by Mevlana Rumi in the 13th century. The Order wrote of tolerance, forgiveness, and enlightenment. They survive today as a cultural brotherhood. They are not theatrical spectacles but sacred rituals. 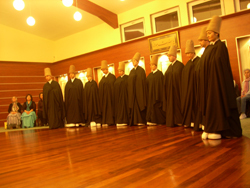 The ritual of the Mevlevi sect, known as the sema, is a serious religious ritual performed by Muslim priests in a prayer trance to Allah. more details.Mevlana Tour Week Konya Turkey ( Annual Seb-i Arus Ceremonies between 01 -17 December 2010 ) 3 night 4 Days Mevlana Week Tour ( Depart from istanbul any days between 01 - 17 December 2010 Day 1 * Meeting in Sultanahmet - Istanbul for brief information. * Take the Night Bus from istanbul - Konya at 24:00,more details.Lecture About Sufism in Istanbul,In this lectures ; We will try to find answer to your questions and explain you the general essences such as ; * What are the doctrines of Mevlana Celaleddin Rumi ? 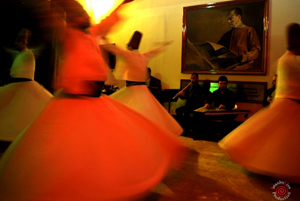 * What does " Dervish " mean in Sufism ? * How is the family life of a Sufi Dervish ? ( Marriage, Children, Family )more details.Islamic Religion Tour in Istanbul ,Sahabe ( The companions of Prophet Muhammed S.A.V )Tombs,Mosques - Cemeteries - Religious PlacesIstanbul is the center of religion for centuries. After the ottoman period Islamic Religion spreaded througout the city. The first mosque in Istanbul was built in Kadikoy on the Asian side of the city, which was conquered by the Ottoman Turks in 1353. more details.hakan hacibekiroglu,WHIRLING DERVISH CEREMONIES IN ISTANBUL TURKEY,Whirling Dervish CEREMONY in Sirkeci Train Station ( Each Thusday and Saturday ) Whirling Dervish CEREMONY in Sirkeci Train Station,Every Tuesday and Saturday ,Start : 19 : 30 pm,Finish : 20 : 30 Pm Price : 40 Turkish Liras,Contact Person : Mr. Hakan HACIBEKIROGLU,more details.Whirling Dervish CEREMONY in Sirkeci Hodjapasha Culture Center ( Everday Except Tuesday and Thursday ),HODJAPASHA HOCAPASA CULTURE CENTER,Everday at 19 : 30 pm ( Monday ,Tuesday, Wednesday,Thursday,Friday,Saturday and Sunday ) Finish : 20 : 30 Pm,Price : 40 Turkish Liras including FREE beverages,Contact Person : Mr. Hakan HACIBEKIROGLU,More details.Whirling Dervish CEREMONY in Silivrikapi ( Each Thursday -- Men and Women together in Worship ) Known to the west as Whirling Dervishes, the Mevlevi Order was founded by Mevlana Rumi in the 13th century. The Order wrote of tolerance, forgiveness, and enlightenment. They survive today as a cultural brotherhood. They are not theatrical spectacles but sacred rituals. The ritual of the Mevlevi sect, known as the sema, is a serious religious ritual performed by Muslim priests in a prayer trance to Allah. more details.Mevlana Tour Week Konya Turkey ( Annual Seb-i Arus Ceremonies between 01 -17 December 2010 ) 3 night 4 Days Mevlana Week Tour ( Depart from istanbul any days between 01 - 17 December 2010 Day 1 * Meeting in Sultanahmet - Istanbul for brief information. * Take the Night Bus from istanbul - Konya at 24:00,more details.Lecture About Sufism in Istanbul,In this lectures ; We will try to find answer to your questions and explain you the general essences such as ; * What are the doctrines of Mevlana Celaleddin Rumi ? 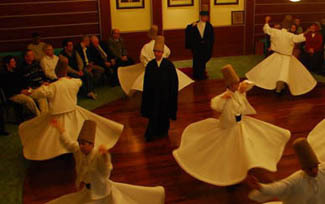 * What does " Dervish " mean in Sufism ? * How is the family life of a Sufi Dervish ? ( Marriage, Children, Family )more details.Islamic Religion Tour in Istanbul ,Sahabe ( The companions of Prophet Muhammed S.A.V )Tombs,Mosques - Cemeteries - Religious PlacesIstanbul is the center of religion for centuries. After the ottoman period Islamic Religion spreaded througout the city. The first mosque in Istanbul was built in Kadikoy on the Asian side of the city, which was conquered by the Ottoman Turks in 1353. more details.hakan hacibekiroglu,WHIRLING DERVISH CEREMONIES IN ISTANBUL TURKEY,Whirling Dervish CEREMONY in Sirkeci Train Station ( Each Thusday and Saturday ) Whirling Dervish CEREMONY in Sirkeci Train Station,Every Tuesday and Saturday ,Start : 19 : 30 pm,Finish : 20 : 30 Pm Price : 40 Turkish Liras,Contact Person : Mr. Hakan HACIBEKIROGLU,more details.Whirling Dervish CEREMONY in Sirkeci Hodjapasha Culture Center ( Everday Except Tuesday and Thursday ),HODJAPASHA HOCAPASA CULTURE CENTER,Everday at 19 : 30 pm ( Monday ,Tuesday, Wednesday,Thursday,Friday,Saturday and Sunday ) Finish : 20 : 30 Pm,Price : 40 Turkish Liras including FREE beverages,Contact Person : Mr. Hakan HACIBEKIROGLU,More details.Whirling Dervish CEREMONY in Silivrikapi ( Each Thursday -- Men and Women together in Worship ) Known to the west as Whirling Dervishes, the Mevlevi Order was founded by Mevlana Rumi in the 13th century. The Order wrote of tolerance, forgiveness, and enlightenment. They survive today as a cultural brotherhood. They are not theatrical spectacles but sacred rituals. 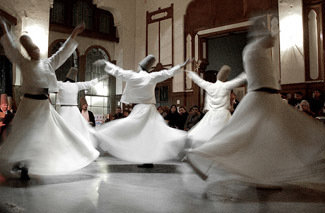 The ritual of the Mevlevi sect, known as the sema, is a serious religious ritual performed by Muslim priests in a prayer trance to Allah,hakan hacibekiroglu,DERVISH CEREMONIES ORGANIZATIONS IN CRUISE SHIP ,Whirling Dervish Ceremony Musicians & Dervishes Group,,4 Whirling dervishes ( 2 Male - 2 Female Dervishes ) ---- 1 Leader semazen,4 musicians ( Ud - Ney - Kanun - Bendir and Vocals ),1 tour Manager,,Mevlevi Ceremony Stages & Duration ,more details. Mevlâna's early spiritual education was under the tutelage of his father Bahauddin and later under his father's close friend Sayyid Burhaneddin of Balkh. The circumstances surrounding Sayyid's undertaking of the education of his friend's son are interesting: Sayyid had been in Balkh, Afghanistan when he felt the death of his friend Bahauddin and realized that he must go to Konya to take over Jalâluddîn's spiritual education. He came to Konya when Mevlâna was about twenty-four years old, and for nine years instructed him in "the science of the prophets and states," beginning with a strict forty day retreat and continuing with various disciplines of meditation and fasting. During this time Jalâluddîn also spent more than four years in Aleppo and Damascus studying with some of the greatest religious minds of the time. branches of learning. You have become a lion of knowledge. I am such a lion myself and we are not both needed here and that is why I want to go. Furthermore, a great friend will come to you, and you will be each other's mirror. He will lead you to the innermost parts of the spiritual world, just as you will lead him. Each of you will complete the other, and you will be the greatest friends in the entire world." And so Sayyid intimated the coming of Shams of Tabriz, the central event of Rumi's life. At the age of thirty-seven Mevlâna met the spiritual vagabond Shams. Much has already been written about their relationship. Prior to this encounter Rumi had been an eminent professor of religion and a highly attained mystic; after this he became an inspired poet and a great lover of humanity. Rumi's meeting with Shams can be compared to Abraham's meeting with Melchizedek. I owe to Murat Yagan this explanation: "A Melchizedek and a Shams are messengers from the Source. They do nothing themselves but carry enlightenment to someone who can receive, someone who is either too full or too empty. Mevlâna was one who was too full. After receiving it, he could apply this message for the benefit of humanity." Shams was burning and Rumi caught fire. Shams' companionship with Rumi was brief. Despite the fact that each was a perfect mirror for the other Shams disappeared, not once but twice. The first time, Rumi's son Sultan Veled searched for and discovered him in Damascus. The second disappearance, however, proved to be final, and it is believed that he may have been murdered by people who resented his influence over Mevlâna. Rumi was a man of knowledge and sanctity before meeting Shams, but only after the alchemy of this relationship was he able to fulfill Sayyid Burhaneddin's prediction that he would "drown men's souls in a fresh life and in the immeasurable abundance of God... and bring to life the dead of this false world with... meaning and love." For more than ten years after meeting Shams, Mevlâna had been spontaneously composing odes, or ghazals, and these had been collected in a large volume called the Divan-i Kabir. Meanwhile Mevlâna had developed a deep spiritual friendship with Husameddin Chelebi. The two of them were wandering through the Meram vineyards outside of Konya one day when Husameddin described an idea he had to Mevlâna: "If you were to write a book like the Ilahiname of Sanai or the Mantik'ut-Tayr'i of Fariduddin Attar it would become the companion of many troubadours. They would fill their hearts form you work and compose music to accompany it." Husameddin wept for joy and implored Mevlâna to write volumes more. Mevlâna replied, "Chelebi, if you consent to write for me, I will recite." And so it happened that Mevlâna in his early fifties began the dictation of this monumental work. As Husameddin described the process: "He never took a pen in his hand while composing the Mathnawi. Wherever he happened to be, whether in the school, at the Ilgin hot springs, in the Konya baths, or in the Meram vineyards, I would write down what he recited. Often I could barely keep up with his pace, sometimes, night and day for several days. At other times he would not compose for months, and once for two years there was nothing. At the completion of each book I would read it back to him, so that he could correct what had been written." and specific details of the natural world, history and geography. It is also a book that presents the vertical dimension of life -- from this mundane world of desire, work, and things, to the most sublime levels of metaphysics and cosmic awareness. It is its completeness that enchants us. First of all, it needs to be understood that Rumi's tradition is not an "Eastern" tradition. It is neither of the East nor of the West, but something in between. Rumi's mother-tongue was Persian, an Indo-European language strongly influenced by Semitic (Arabic) vocabulary, something like French with a smattering of Hebrew. Islam is understood as a continuation of the Judeo-Christian or Abrahamic tradition, honoring the Hebrew prophets, as well as Jesus and Mary. Muslims, however, are very sensitive to the issue of attributing divinity to a human being, which they see as the primary error of Christianity. although Jesus is called the in the Qur'an "the Spirit of God," it would be thought a blasphemy to identify any human being exclusively as God. Muhammad is viewed as the last of those human prophets who brought the message of God's love. In Rumi's world, the Islamic way of life had established a high level of spiritual awareness among the general population. The average person would be someone who performed regular ablutions and prayed five times a day, fasted from food and drink during the daylight hours for at least one month a year, and closely followed a code which emphasized the continual remembrance of God, intention, integrity, generosity, and respect for all life. Although the Mathnawi can appeal to us on many levels, it assumes a rather high level of spiritual awareness as a starting point and extends to the very highest levels of spiritual understanding. The unenlightened human state is one of "faithlessness" in which an individual lives in slavery to the false self and the desires of the materials world. The spiritual practices which Rumi would have known were aimed at transforming the compulsiveness of the false self and attaining Islam or "Submission" to a higher order of reality. Without this submission the real self is enslaved to the ego and lives in a state of internal conflict due to the contradictory impulses of the ego. The enslaved ego is cut off from the heart, the chief organ for perceiving reality, and cannot receive the spiritual guidance and nourishment which the heart provides. Overcoming this enslavement and false separation leads to the realization and development of our true humanity. spiritual maturity is the realization that the self is a reflection of the Divine. God is the Beloved or Friend, the transpersonal identity. Love of God leads to the lover forgetting himself in the love of the Beloved.